The agonizing debate over U.S. healthcare reform is a painful but necessary step in solving the problem. Fortunately, technologies are coming along at a rapid clip that will unleash the innovation that a solution demands. That was the consensus of a panel of healthcare experts, practitioners, and technology providers who gathered at Inforum 2017 to discuss solutions to the healthcare dilemma. All agreed that they’re optimistic that solutions will be found, but they also agreed it’s time for talk to give way to action. The reform process starts with taking a patient-centric approach to care that stresses good health rather than procedures and prescriptions to treat illnesses. If consumers take more control of their health, they’ll also take more responsibility. That means fewer doctor visits and greater emphasis on prevention. Technology can help, said Perlman, ticking off a list of possibilities. Wearables can challenge consumers to track progress against goals that they set themselves. Robotics can be applied to routine examination and diagnosis procedures to free expensive medical professionals from those tasks. Telemedicine enables healthcare providers to diagnose conditions remotely and consult with colleagues. Augmented reality empowers doctors to simulate procedures and get collaborative, hands-on advice from experts before making actual incisions. And that’s about improving patient experience, a factor that’s taking on new importance in the debate over how to pay for care. Payment providers are increasingly using tools like Consumer Assessment of Healthcare Providers and Systems (CAHPS) surveys to factor patient satisfaction into their payment guidelines. Value-based programs defined by patient experience and wellness now determine up to one-quarter of the reimbursements providers get from Medicare and Medicaid. But beyond the penalties, there are good business reasons to adopt these metrics, Perlman said. A Deloitte study found that a 10% improvement in the number of patients who rate hospitals as excellent increased hospital profit margins by 1.5%. Technology can also be put to work matching people to jobs so that employees are engaged with, and enthusiastic about their work. “The ability to get the right people into the right jobs and progress them through their career ladder is going to be critical,” said Lisa Stump, SVP and CIO at Yale New Haven Health. That’s one area where Infor is bringing its expertise to bear. The company’s healthcare customers can use the cloud-based Infor Talent Science application to conduct behavioral modeling that pairs people with the best jobs. “The operating room nurse and the admitting nurse are very different personalities. 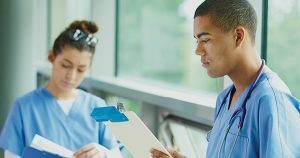 By having these tailored behavioral roles, you can be sure you’re putting the right people in the right places,” said Mark Weber, SVP of healthcare development at Infor, which serves 72% of the largest healthcare provider organizations and 22 of the top 25 integrated delivery networks in the U.S.
Infor provides the industry’s only integrated cloud solution for healthcare, giving providers the ability to analyze costs and service delivery by factors such as hospital, service line, physician, patient, and type of service. Infor’s offerings in areas like asset management, facilities management, and supply chain management can also help providers get a detailed picture of their costs and to optimize them accordingly. The company also partners with top healthcare information service providers like Cerner Corp. to integrate their databases with their own. Infor’s eventual goal is to help providers manage customer care and costs down to the individual patient level by pulling data from electronic health records into its analytics. “You might have two patients with pneumonia but very different physical characteristics. We have the ability take that information into account and allocate the appropriate materials and staffing for each,” Weber said. Which is not only cost-effective, but also consistent with the humanitarian objects of healthcare professionals. After all, the ultimate objective isn’t about money, but people.